We’ll assess the floorboards for damage and unevenness. Loose boards will be realigned, removing any old tacks and nails. Protruding nails are hammered flat. For those boards damaged beyond repair, we will replace them - wherever possible - with reclaimed timber of the same quality and age. both draughts and the build up of dust between the gaps. 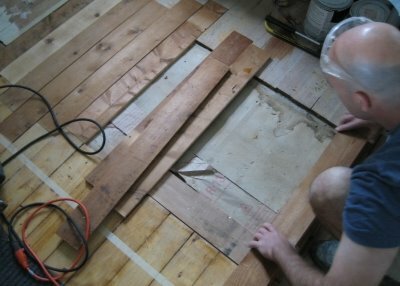 It also tightens the floor and helps prevent timber movement. * resin mix - mostly used on parquet and mosaic floors with lots of fine gaps. 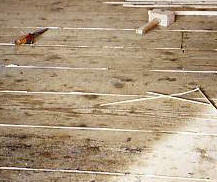 Dust from the floor is mixed with a resin and applied to the gaps with a filling knife. Solid fillets of reclaimed pine and other timbers are glued, forced into the gaps, and chiselled back before sanding flat. For wooden floor repairs - contact us today on 020 3369 4505!